Please Like, Comment, and Share. Be sure to subscribe for future videos. 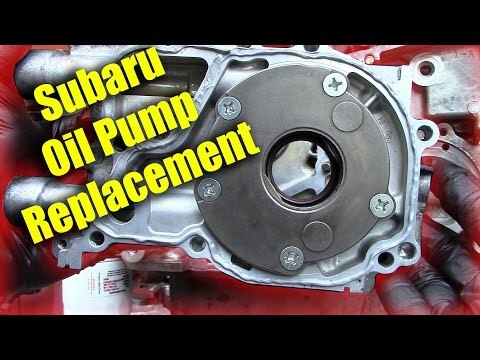 General overview of an oil pump replacement on a 1998 Subaru EJ25D engine. Punching out an oil seal? Nice job damaging the metal on the pump! How do you prime one of these?? Is it good on start up when you clear the ECU and it takes about 5 seconds to start? Will that be enough to prime the oil pump?? I'm curious why you pulled the woodruff key? What year EJ is this? I've done this job on a 2011 EJ253 and a 1999 and neither required it nor is it called out in the FSMs I have for those cars. Is outside of the seal supposed to be lubed prior to pressing in if pump & seal are new? Is Three Bond 1215 recommended over Permatex 82194 Ultra Gray or vise versa? According to Amazon reviews in May 2018, 8.8oz TB1215 costs $27.58 and only has 3 stars reviews from 11 people, but 3.5oz Ultra Grey costs only $4.78 and has 4.5 stars reviews from 156 people. My woodruff key is stuck… tried to pry it, tap it with a screwdriver, vice grips (started to mar it…). Do you have any suggestions for a stuck woodruff key and how important is it that the key not be marred (in other words, use a new woodruff key makes sense…). Thanks!